Oregon State University moved to its current location in 1889. The Department of Physics at was started in 1908 with the appointment of Dr. Willibald Weniger as Assistant Professor of Physics. The physics offices and laboratories were located in Mechanical Hall (now Apperson Hall) where they remained until 1928 when a new Physics building (now Covell Hall) was completed. In 1959, the department moved into another new physics building (now Weniger Hall). More historical details are found on our history page . 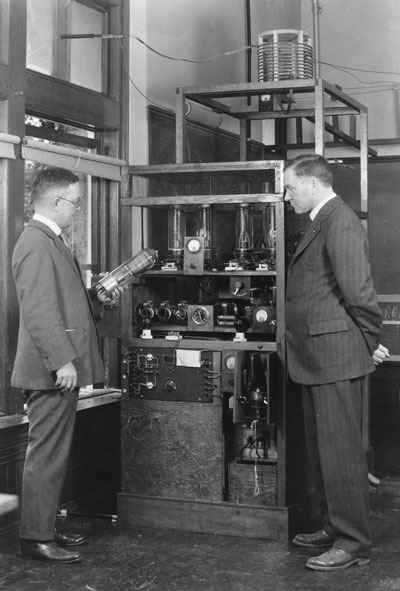 Professor Jordan (left) and Prof. Weniger (right) photographed in 1928 with an early radio transmitter, KFDJ, 5 watts. Courtesy OSU Archives P095:061 .